1-اگر خواهان تبادل لینک با ما هستید پس از گذاشتن لینک ما در وبلاگ خود ، آدرس وبلاگ خود را برای ما در زیر همین پست کامنت کنید . 2-استفاده بدون مبنع از مطالب وبلاگ بلامانع است . good websites for learning and teaching English. هرچند این پست ربطی به موضوع وبلاگ نداره - اما چون خیلی کاربردیه به نظر من لازمه که باهاش آشنایی داشته باشید . 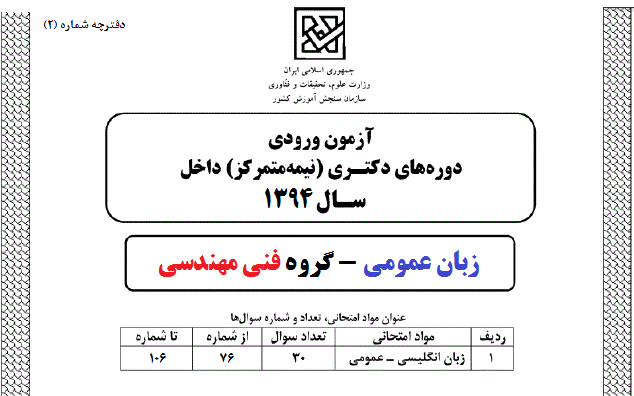 یکی از اصلی ترین کاربرد های اینترنت ارسال و دریافت فایل های مختلف است. ارسال فایل به اینترنت را Upload و دریافت اطلاعات از اینترنت را Download میگویند. شما میتوانید یک فیلم، آهنگ، عکس، نرم افزار، بازی و... را از اینترنت دانلود کنید. اما برای آسان تر شدن این دانلود نیاز به یک نرم افزار کمکی دارید. نرم افزاری که به کمک آن بتوانید در میانه کار دانلود را متوقف کنید و ادامه آن را در ساعت دیگری ادامه دهید. اینترنت دانلود منیجر یا IDM بهترین نرم افزار مدیریت دانلود است. به کمک این نرم افزار میتوانید کارهای بسیار زیادی در زمینه دانلود انجام دهید که در ادامه مطلب آن ها را بازگو خواهیم کرد. برای دانلود یک فایل به صورت معمولی، روی آن کلیک چپ میکنید. اما اگر میخواهید با استفاده از نرم افزار IDM این فایل را دانلود کنید روی آن کلیک راست کرده و سپس گزینه Download with IDM را بزنید. اگه دنبال یه منبع جمع و جور واسه زبان عمومی دکتری میگردید منبع زیر رو دانلود کنید . یکی از دوستان کامنت گذاشته بودند و تفاوت بخار و گاز رو پرسیده بودند . متأسفانه از این دو واژه ای که گفتید یعنی گاز (Gas) و بخار (Vapour) در فارسی بعنوان واژه های هم معنی استفاده میشه. بهرحال گاز از مولکول های مجزا و منفرد تشکیل شده. اما بخار نوعی آئروسل بشمار میره؛ یعنی مخلوط مایع در گاز. برای مثال بخار آب با فاز گازی آب بسیار تفاوت داره. فاز گازی آب هیچ رنگ مشخصی نداره و کاملاً شفاف و نامرئیه (مانند رطوبت طبیعی موجود در هوا) اما بخار آب از ذرات بسیار ریز آب معلق در هوا تشکیل شده که نور رو میشکنن و منعکس میکنن و بنابراین بصورت توده ای سفید رنگ دیده میشه. What is a megawatt or a megawatt-hour? Manufacturers measure the maximum, or rated, capacity of their wind turbines to produce electric power in megawatts (MW). One MW is equivalent to one million watts. The production of power over time is measured in megawatt-hours (MWh) or kilowatt-hours (kWh) of energy. A kilowatt is one thousand watts. Production of power at the rate of 1 MW for 1 hour equals 1 MWh of energy. General Electric (GE) makes a once widely used 1.5-megawatt model. 1.5 MW is its rated, or maximum, capacity, at which rate it will produce power when the wind is in the ideal range for that model, between 27 and 56 mph. Turbines are now generally in the range of 2-3 MW. What determines how much power a wind turbine can produce? The power is generated from the energy in the wind, so a turbine’s power is determined by its ability to capture that energy and convert it to rotational torque that can turn the generator and push electrons into the grid. A taller tower provides access to steadier winds, and larger blades capture more wind energy. A larger generator requires larger blades and/or stronger winds. Every wind turbine has a range of wind speeds, typically around 30 to 55 mph, in which it will produce at its rated, or maximum, capacity. At slower wind speeds, the production falls off dramatically. If the wind speed decreases by half, power production decreases by a factor of eight. On average, therefore, wind turbines do not generate near their capacity. Industry estimates project an annual output of 30-40%, but real-world experience shows that annual outputs of 15-30% of capacity are more typical. The capacity factor is the actual output over a period of time as a proportion of a wind turbine or facility’s maximum capacity. For example, if a 1.5-MW turbine generates power over one year at an average rate of 0.5 MW, its capacity factor is 33% for that year. What is the typical capacity factor for industrial wind turbines? The average capacity factor for 137 U.S. wind projects reporting to the Energy Information Agency in 2003 was 26.9%. The total capacity factor for EU-27 countries in 2007 was 13%, according to the EIA. What is the difference between capacity factor and availability? The turbine’s “capacity factor” is its actual average output as a fraction of its full capacity. This is usually between 15% and 30%. Neither. The first figure is a theoretical capacity factor, the amount of energy actually produced over a year as a fraction of the turbines’ maximum capacity. The second figure is availability, the amount of time that a turbine is not shut down. Neither figure expresses the amount of time that a wind turbine is actually generating electricity. How much of the time do wind turbines generate energy? Wind turbines generate electrical energy when they are not shut down for maintenance, repair, or tours and the wind is between about 8 and 55 mph. Below a wind speed of around 30 mph, however, the amount of energy generated is very small. Wind turbines produce at or above their average rate around 40% of the time. Conversely, they produce little or no power around 60% of the time. Are capacity factor and efficiency the same? No. Efficiency is a measure of how much of the kinetic energy in the wind is converted to electrical energy. It is unavoidable that some energy is lost in the conversion process. Even when a wind turbine is generating power at its maximum capacity, the electrical energy produced is only a fraction of the energy in the wind. (At best, it is around 50%, which is usually reached before generating at full capacity.) Efficiency is a matter of engineering and the limits of physics and usually irrelevant to normal discussion. Capacity factor is a measure of a wind turbine’s actual output, which varies with the wind speed, over a period of time. It must be remembered, though, that wind power is intermittent and variable, so a wind turbine produces power at or above its annual average rate only 40% of the time. That is, most of the time, it is not providing its average power to its average number of homes. And the times of high wind production rarely correspond with times of actual demand on the grid. It must also be remembered that residential use accounts for only a third of our total electricity use. How does wind variability affect wind power reliability? A wind turbine’s production is usually expressed as an annual average, which masks its highly variable output. But because production falls off dramatically as the wind speed drops (by a factor of eight for every halving of the wind speed), most of the time the wind turbine is producing well below its average rate. The average rate of output or more is seen only about 40% of the time. How does wind power’s variable output affect the grid? Wind turbine production of power responds to the wind, which even at the “best” sites varies dramatically from hour to hour and minute to minute. The grid, however, must respond to user demand. Since the grid dispatchers can’t control wind power production any more than they can control user demand, wind turbines on the grid do not contribute to meeting demand. By pushing power into the grid, they simply add another source of fluctuation that the grid must balance. Also see intermittency in “The Grid” FAQ. How much back-up power is needed for wind power? According to Eon Netz, one of the four grid managers in Germany, with 7,050 MW of wind power capacity installed in its area at the end of 2004, the amount of back-up required was over 80%, which was the maximum output observed from all of their wind power facilities together. That is, for every 10 MW of wind power added to the system in this case, at least 8 MW of back-up power must also be dedicated. In other words, wind needs 100% back-up of its maximum output. Doesn’t a unit of electricity produced by wind turbines reduce a unit from another source? Because the grid must continuously balance supply and demand, yes, it must reduce the supply from somewhere else when the wind rises enough to start generating power. Can wind turbines help avoid blackouts? No. Wind turbines themselves need power from the grid to work. A blackout knocks them out, too. If they were providing power at the time, that loss aggravates the effect of the blackout. What is the difference between large and small turbines? Small turbines are designed to directly supply a home or other building. Their variable output is balanced by battery storage and supplemented by the grid or an on-site backup generator. Large turbines are designed to supply the grid itself. The variable output of large wind turbines adds to the complexity of balancing supply and demand, because there is no large-scale storage on the grid.